My goal as trainer is to teach people to become better trainers for their dogs. Not just the dog they are currently working with, not just the sit exercise they want to improve. To become better trainers for all dogs they may have in future. To teach to fish rather than give a fish. What it means to be independent? If we lack foundation training, knowledge about science of learning, methodology of teaching, of breaking skills into tiny pieces we are like Swiss cheese. Sometimes we are able to work on very complicated things but there comes a time when those holes in our training become an issue. People who didn’t spend time learning step by step the science and art of training will never become independent trainers, will always need help. No shortcuts, art of training is equally important as the science. If you have issues with timing your clicks and delivering food you have to learn it before going forward. Split criteria, find someone who will help you do it. Spend time working on foundation skills. Too often we start with teaching our dogs complex behaviors.The foundations that may be extremely valuable for dogs, for example: understanding of reinforcement process, response to our behaviors, physical preparation, clarity of criteria, choice are neglected and often forgotten. 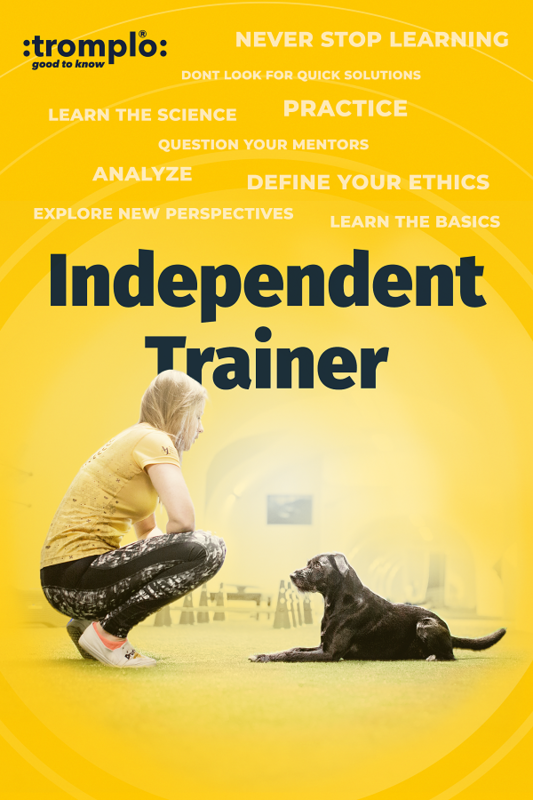 Independent trainer combines science with art. Which means you need to learn both. You need to know why something works and why it doesn’t. Many trainers tend to focus on complicated behaviors before they even get to know the science of dog training, they believe it is an innate knowledge. Why nobody seems to believe to have innate mathematical knowledge on the academic level? What is so different in dog training form any other field of work, that allows us to practically skip the whole process of our education and call ourselves trainers? Can we imagine learning matrix, solving complicated functions without first understand the concept of digits, multiplications or subtraction? Then why do we try to do this working with dogs? We often hear about intuition, talent, sixth sense, inner abilities of dog trainers. But what do these terms mean? How can we use these words and not have any knowledge about teaching techniques, process of learning whatsoever. It produces trainers who know only one method and use it schematically, without giving it any though, not knowing what they are actually doing. I can tell what you need to do, but I can’t do it for you. You have to practice. When was the last time you practiced your handler’s skills? How much time do you spend working on your timing, mechanics and control in relation to the time spent on your dog’s skills? Do you know that your dog’s skills are reflection of your own? Very often we forget how important it is to focus on our own preparation before even working with dogs. Being able to mark in time, properly delivery reinforcement is not a something extra, it’s our obligation as a trainer! Very often we expect from our dogs much more than from ourselves. Why you teach this behavior, why you use this and not that method, why did you reinforce at this moment, why did you deliver in this way? Training is all about those nuisances that together make the difference between average and great. don’t rush, enjoy the process. Learning is process. Consider training a journey that never ends. Learning is about discovering, rewriting what was known as rock solid, re-labelling and turning things upside down. It’s never linear and stable. It doesn’t always feel safe because it’s about going deep into unknown and getting into details of what we took for granted. It is slippery and wobbly sometimes. It requires to step outside of your comfort zone and to lever what you believed was right for a very long time. It’s about being open minded and confident enough to say I Was Wrong. Of course it sometimes feel risky and makes you feel irritated. It is often hard to question what gives you confidence and stability. Don’t ever stop challenging yourself even when you feel you are good at what you do. There is always more you can learn. don’t look for quick solutions. I like to compare it a musician who says he makes errors when playing fast. When you ask him have you tried playing slow with metronome he says “no but I have problem with fast songs and this is what I want to fix”. 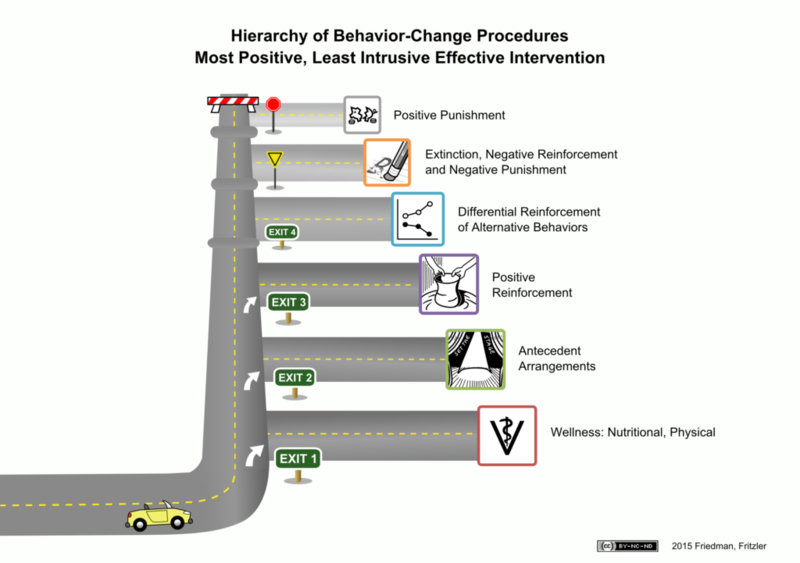 We don’t fix behavior we teach them. If we fail to spend time working on foundations we become like Swiss cheese. Able to do this and that but full of holes, that will get us in troubles in future. Don’t try to “fix it”, take time to go back to beginning, plan your training so that you can actually build those skills and maintain fluency throughout the process. You will not find “5 most important cues” or “10 easy fixes for position changes” at Tromplo. There is nothing wrong with them, but our goal is to teach independent trainers, who will be able to come up with those on their own. You can do it. Nobody is perfect, and nobody is always right. It’s good to have people you look up to. But don’t get attached to just one person, one trainer. Make sure you learn different perspective, make sure you learn from different people. you don’t have to be the smartest person in the room. It is good to ask for help, that’s exactly what independent trainers do. They learn from each other. They share experience, help each other. Find a group of people who share similar approach to training. Ask, discuss, don’t be afraid to say “I don’t know” or that you need help with something. – it’s okay to change your perspective and views. That’s perfectly normal. If it wasn’t it would mean that we didn’t learn. Learning is change of behavior due to consequences. Change is crucial part in this short definition. We change because we learn. We all make mistakes, we all changed what we did years ago.